We provide innovative resources for hardware synthesizers, software synthesizers and mobile music apps. 31 dec 2017 The Roland Boutique D-05/Roland D-50 Editor/Librarian/Patch sharing utility is now available. 20 apr 2017 The Roland Boutique JP-08 Editor now has access to a hidden Chorus effect with three different settings - similar to the one on the JU-06. The chorus reqiuires the latest firmware from Roland. 8 jan 2017 The JP-08 Editor/Librarian/Patch sharing utilities now send changes made in the editor and complete patches from the library to both layers (Upper/Lower) on the JP-08 synth. This makes it easier to preview how the patch will sound in dual mode with the same sound on both the Upper and Lower layers. Activate this functionality by enabling Dual mode on your JP08 hardware and by checking "Send data to both Upper/Lower layers" in the editor. The new functionality is MIDI CC based so 1.10 firmware or later is required. 13 oct 2016 The Roland Boutique JU06 and JX03 Editors/Librarians/Patch sharing utilities now also respond to MIDI CC as well as SYSEX. This means that you can use all the 3 editors without a separate MIDI interface. If you want to use the editors with MIDI CC you have to install the new firmware from Roland and you must also set up the JU06/JX03/JP08 to send out MIDI CC (please see the Roland Firmware manual addendum for more info). Please also note that CC messages are not sent when you change patch or press the Manual button so whole patches are not transferred this way into the edior while using MIDI CC. This behaviour is different from when using SYSEX. At the moment the editors only respond to CC messages on MIDI channel 1. 19 aug 2016 The Roland Boutique JP08 Editor/Librarian/Patch sharing utility now responds to MIDI CC as well as SYSEX. This means that you can use the editor without a separate MIDI interface. If you want to use the editor with MIDI CC you have to install the new firmware from Roland and you must also set up the JP08 to send out MIDI CC (please see the Roland Firmware manual addendum for more info). Please also note that CC messages are not sent when you change patch or press the Manual button on the JP08 so whole patches are not transferred this way into the edior while using MIDI CC. This behaviour is different from when using SYSEX. 18 feb 2016 The Roland Boutique JX-03 Editor/Librarian/Patch sharing utility is now available. 10 feb 2016 Great thanks again to Bobnorbob for sharing over 100 original presets from the Juno 106 in the JU-06 editor! 1 feb 2016 The editors now contain a very extensive arpeggiator! It is fun to use while programming and testing out patches and you can even jam with it. The arpeggiator is synchronized to the Boutique clock and sequencer (you set the tempo on the Boutique). It is possible to set up the arpeggiator for a defined keyboard range and then you can have three things going on at the same time with a single JP-08 or JU-06 (sequencer, arpeggiator and manual playing) Stability and accuracy of timing might not be perfect and can be affected by your computer performance, operating system and apps/concurrent web pages open. 15 jan 2016 The integrated public patch library is now up and running for both the JP-08 and the JU-06 Editors with a number of patches available already for both models. Just press "Public Library" in the editor to use it. You don't have to be logged in to load the shared patches into your Roland Boutique syntheziser. 11 jan 2016 The Roland Boutique JU-06 Editor/Librarian/Patch sharing utility is now available. 06 jan 2016 The Roland Boutique JP-08 Editor/Librarian/Patch sharing utility is now available. 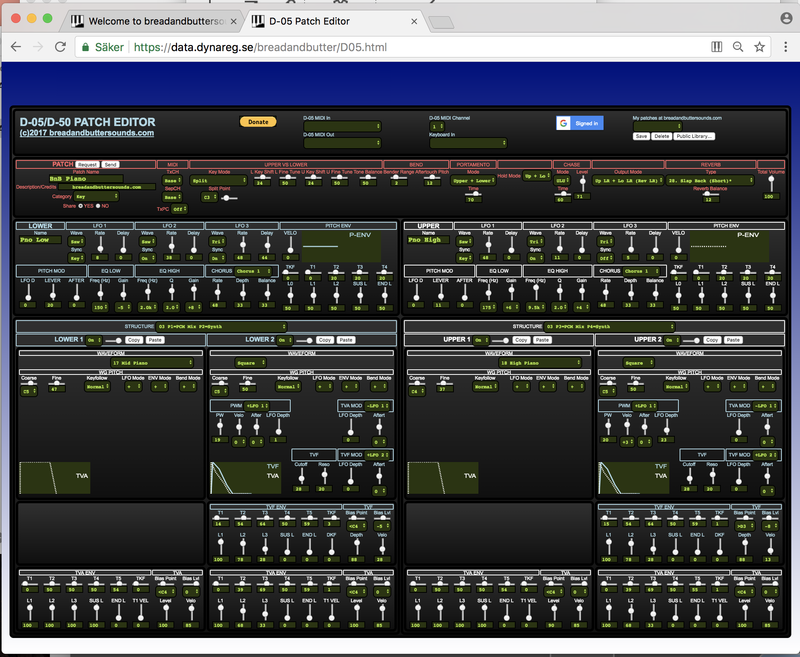 Free Online Roland D-05/D-50 Editor/Librarian/Patch sharing utility The editor uses the Web MIDI API. Please read the instructions below before you use it. And don't hesitate to click the Donate button if this editor is useful to you and if you would like to support further development of this editor and other upcoming releases. See all the 316 (or something like that) parameters of a D-05/D-50 Patch at the same time - a feature not present in any other D-05/D-50 editor out there(?). You can of course use the zoom function of the browser if you would like to focus on a specific area instead. Copy/Paste beteen partials. You can even paste partial parameters between patches this way. Please note that if you paste a partial into a layer with another configuration than the source (PCM/Synth) then the result might look confusing. A public patch library/patch sharing utility is integrated into the editor. You don't have to be logged in to access the patches. Web MIDI is not widely supported yet. The editor will probably only work in Chrome and not on iOS (but Android should be OK if you're using a separate MIDI interface). If you use built the Roland Boutique K-25 keyboard then select D-05 (or driver name) as both "D-05 MIDI In" and "D-05 MIDI Out". Don't forget to install the D-05 driver on Mac or Windows. If you use an external MIDI interface select it as input and output. If you have an external keyboard select it as "Keyboard In" but to avoid latency it might be better if you have the opportunity to connect the keyboard directly to the D-05 using a MIDI Cable (the D-05 can still be attatched to the computer with USB). To avoid a MIDI loop don't select the D-05 driver as "Keyboard In" - just use it if you have another keyboard to connect. Consider the current version of the editor as a beta version. Please e-mail info@breadandbuttersounds.com for bug reports and suggestions. The software is developed using a D-05 but should work with a classic D-50 also (not tested yet so please report if it works or not). 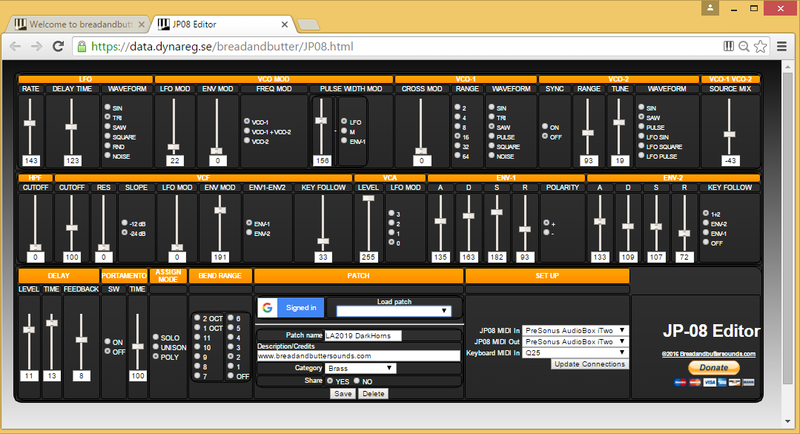 Breadandbuttersounds is not responsible for lost presets, or other negative effects on your D-05/D-50 or other equipment by using the editor. Turn off the partials you are not working on at the moment to hear better the result of your changes. Use the D-05 in "clean" mode if you want improved timing for fast/sequenced sounds. The editor includes an arpeggiator which is synchronized to the Boutique clock and sequencer (you set the tempo on the Boutique). Stability and accuracy of timing might not be perfect and can be affected by your computer performance, operating system and apps/concurrent web pages open. Web MIDI is not widely supported yet. The editor will probably only work in Chrome and not on iOS. The editor will NOT work with the USB connection to the JX-03. (Because no sysex is transmitted over USB with the current JX-03 firmware) You must use a separate MIDI interface (5 pole DIN) for both input and output. 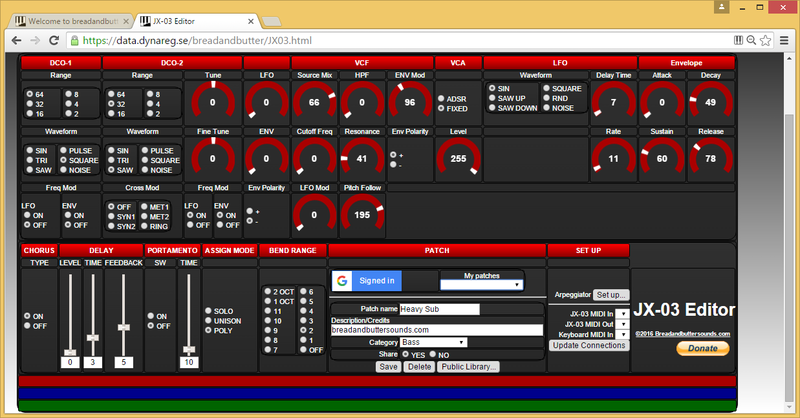 Breadandbuttersounds is not responsible for lost presets, or other negative effects on your JX-03 or other equipment by using the editor. The editor will NOT work with the USB connection to the JU-06. (Because no sysex is transmitted over USB with the current JU-06 firmware) You must use a separate MIDI interface (5 pole DIN) for both input and output. Breadandbuttersounds is not responsible for lost presets, or other negative effects on your JU-06 or other equipment by using the editor. The editor uses the Web MIDI API. It is important to read the instructions below before you use it. Please use the Donate button if this editor is useful to you and if you would like to support further development of it. The editor will NOT work with the USB connection to the JP-08. (Because no sysex is transmitted over USB with the current JP-08 firmware) You must use a separate MIDI interface (5 pole DIN) for both input and output. Breadandbuttersounds is not responsible for lost presets, or other negative effects on your JP-08 or other equipment by using the editor. This is a Web MIDI editor for the Behringer Model-D systems parameters like Key Priority (Low, High, Last), Multi Trigger (On, Off), Pitch Bend Range (0-12 semitones) and other settings. Run the editor here! A patchset for the great FM4 iOS synthesizer by Primal Audio. Please watch the demo video below. The first patchset contains 35 selected musically useful and expressive patches with great sonic variation. Don't forget to use the mod-wheel! Important! Try this to verify that you know how to add the patches to your iPad e.g. in iTunes before you buy the commmercial sound set. Q: Why do I need a Google account to store my Roland Boutique patches online? A: Because we found it easy and fast to get started with from a programmer's view and we didn't want to spill valuable programming time on setting up a system for user handling. We plan to add alternative methods for logging in like Facebook in the near future. Q: Are my patches stored by Google? Can they see them? A: No, we only use Google accounts for log in reasons. Patch data and user information to be able to retreive your patches is stored on our servers. A: It's easy to create one here You don't even need to have or create a gmail address, just use your regular.